The monthly payroll employment report gets a lot of attention. The monthly estimates are based on a survey sample of employers (differing from the monthly survey of households that is the source of unemployment and labor force estimates). Prior year monthly payroll estimates are revised early each year as more complete data (than the sample survey) are analyzed. For a number of reasons (including the fact that newer firms are slow to get included in the survey) NH’s employment estimates more often than not have shown stronger (than first reported) job growth rates. Not this year. The new benchmark numbers have cut the state’s annualized job growth by more than half (to below 1%). The chart below shows the year-over-year growth rate in private sector employment in NH is about 1% (including government employment shows a slightly slower rate of job growth 0.8%). Early in 2018 I forecast NH’s job growth for 2018 would be about 0.6% (based on labor force constraints – not a weaker economy) and for several months I have been issuing a mea culpa for what looked like a significantly inaccurate employment growth forecast. 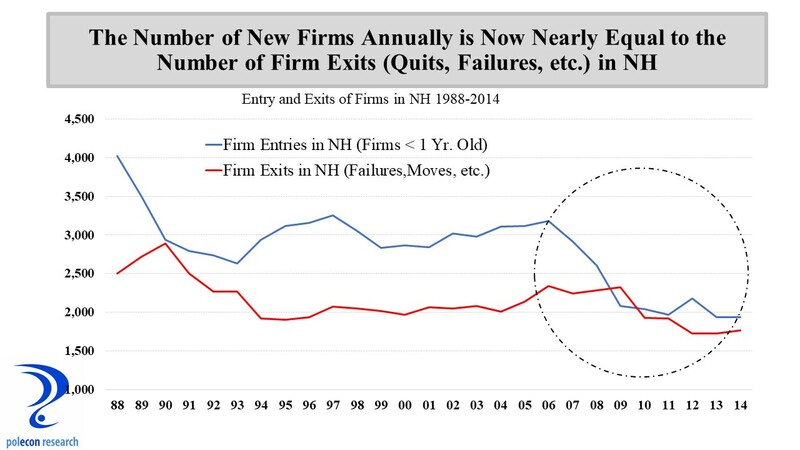 While my sagacity is less challenged than I originally thought, I was more comfortable with NH’s employment trends when it was. The May U.S. jobs report with downward revisions to the March and April job numbers was bad, not bad enough that you should start stocking canned goods and bottled water in your basement but bad nevertheless. The impact of 35,000 striking Verizon Corp. workers on the May numbers is cited as one explanation for the weak report but there were 25,000 temporary workers hired by the company during the strike so the overall impact was actually fairly small. Seasonal adjustment factors (the statistical procedure used to smooth regular annual fluctuations in employment data throughout the year– things like Christmas hiring, summer employment of youth etc.) 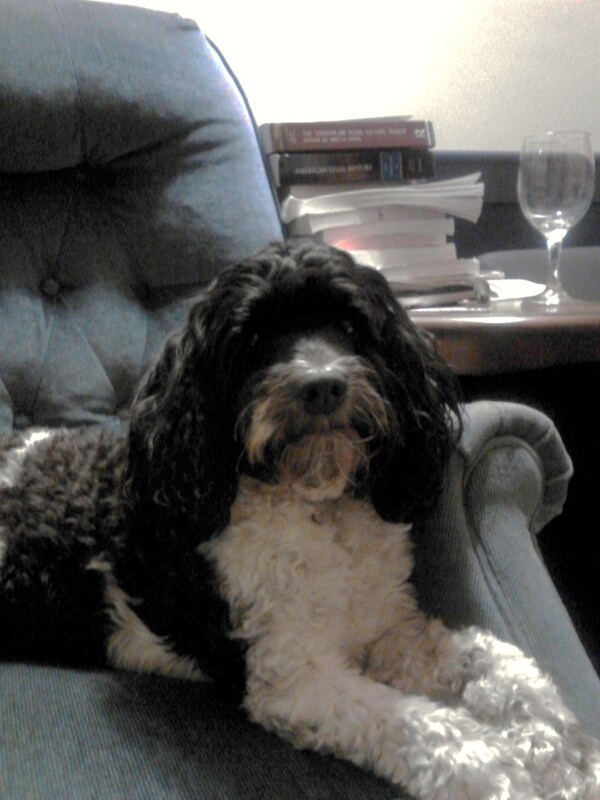 seem to be more problematic in recent years and that may also be a contributor. Of course it is possible that hiring was just weak, plain and simple. Hiring will continue to weaken, I just don’t think job growth is really as weak, and the slowdown as rapid, as the May jobs report suggests. The first rule of politics is to forget all of the rules of economics and that is more problematic now that the national political climate seems to increasingly influence real economic variables. Think of the impact that debt ceiling debates and government shutdown threats have had on economic activity recently. With almost no focus in the current presidential election on sound economics and economic policies it is easy to see how politics could contribute to a weak May jobs report (when the empirical evidence doesn’t provide a clear explanation for economic events it is hard to go wrong blaming politics and politicians). But there is some evidence that presidential elections can temporarily depress job growth. The uncertainty of a presidential election, especially in a year without an incumbent, and the people and policies that candidates may employ in their administration can give pause to businesses investment and hiring decisions. The uncertainty surrounding future economic and fiscal policies in a presidential election year should arguably be greater several months prior to the election rather than a month or two when the election outcome and policy directions become clearer. I compared average private sector job growth (government employment should not be affected) in the U.S. during the months of June-August in presidential election years, to the average job growth from September (of the year prior to the election) to May (of the election year). Since 2000, in each presidential election year the average private sector job growth from June-August significantly lagged average job growth over the prior nine month (Sept-May) period. The pattern held in 2008 but because the U.S. economy was in free fall for other reasons it is not included here. In years with no presidential election this generally was not the case (years such as 2002, 2003 and 2007 when the U.S. was entering or exiting a recession are exceptions). Job growth in NH is going to slow regardless of political uncertainties given existing labor force constraints. 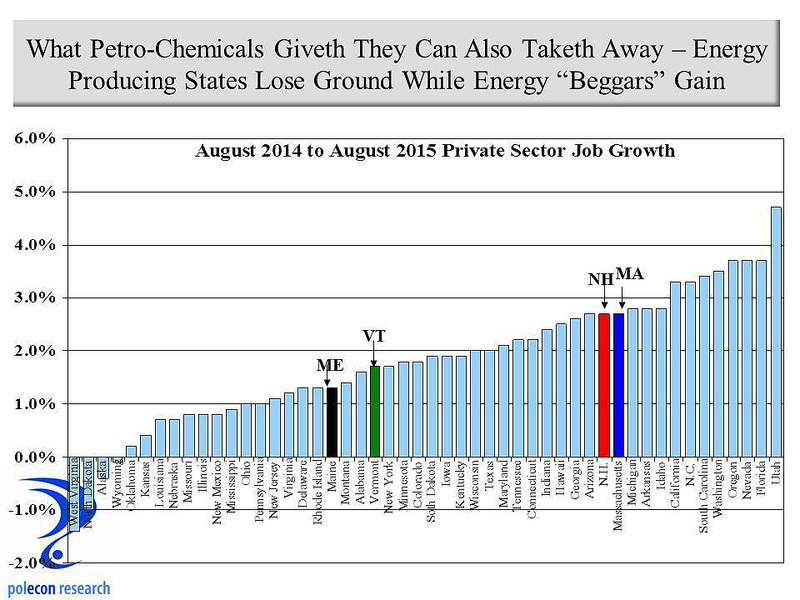 NH is essentially at full employment and the nation is close. 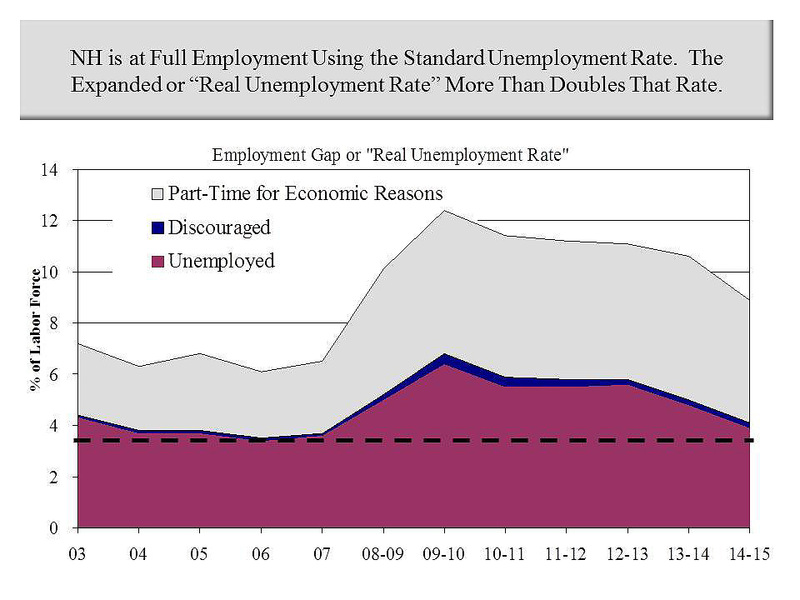 The longer a recovery lasts the greater are the chances that job growth will slow. Still, there are more uncertainties regarding the presidential candidates and the policies that could affect business and the economy in this election than is typical in a presidential year so it is not unrealistic to think that politics is already affecting hiring and investment decisions. 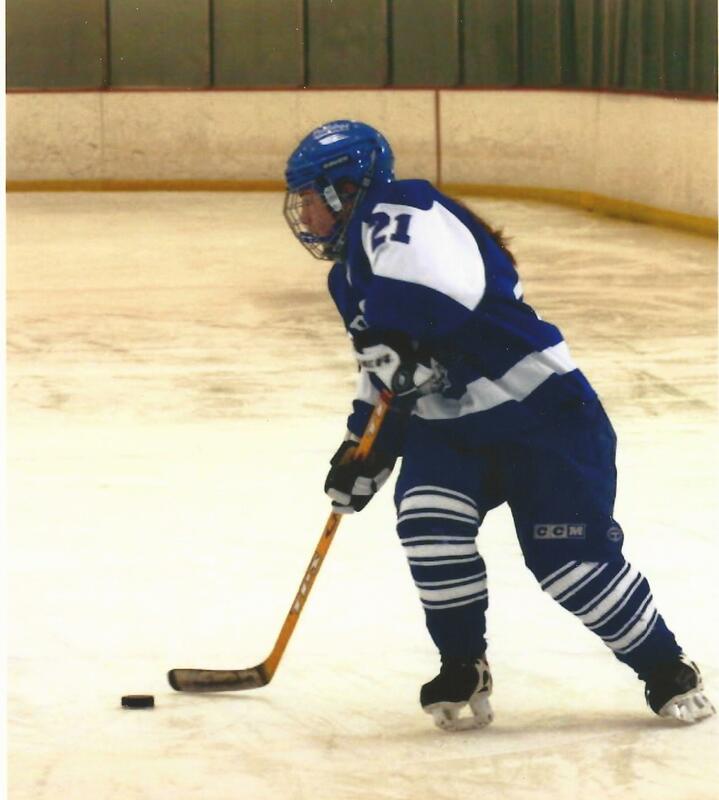 Will New Hampshire Follow the National Trend? State level job growth numbers for May will be released June 17th. In a small state like NH monthly job growth can be especially volatile. Up or down conclusions about a state’s economy should not be drawn from a single month of employment data. 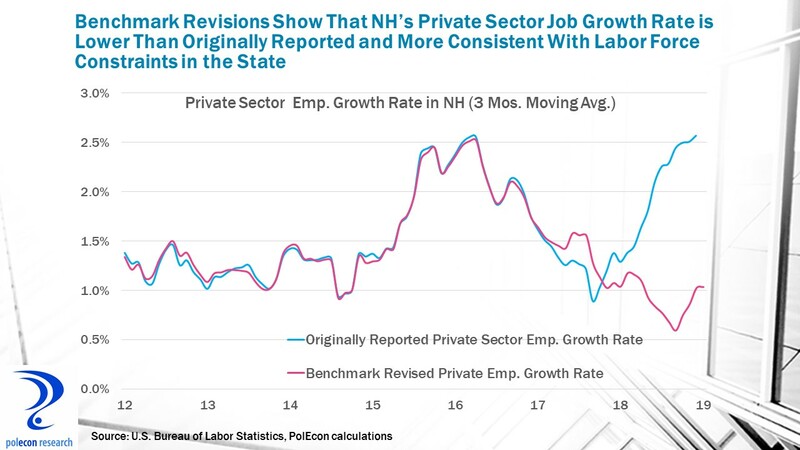 A three month trend in private sector employment is a better reflection of the direction of a state’s economy and by that metric NH has been on a roll. The chart below shows that after several years of below national average private sector job growth, the pace of job growth in NH is now at a level equal to the U.S. average. Moreover, the growth trend for NH has accelerated while the rate of private sector job growth in the U.S. has decelerated. 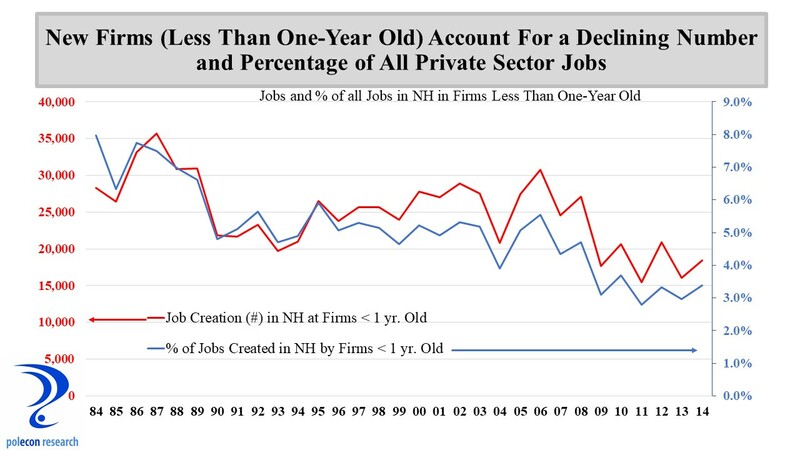 The rate of private sector job growth NH is going to slow nonetheless, just as it has in the nation overall. 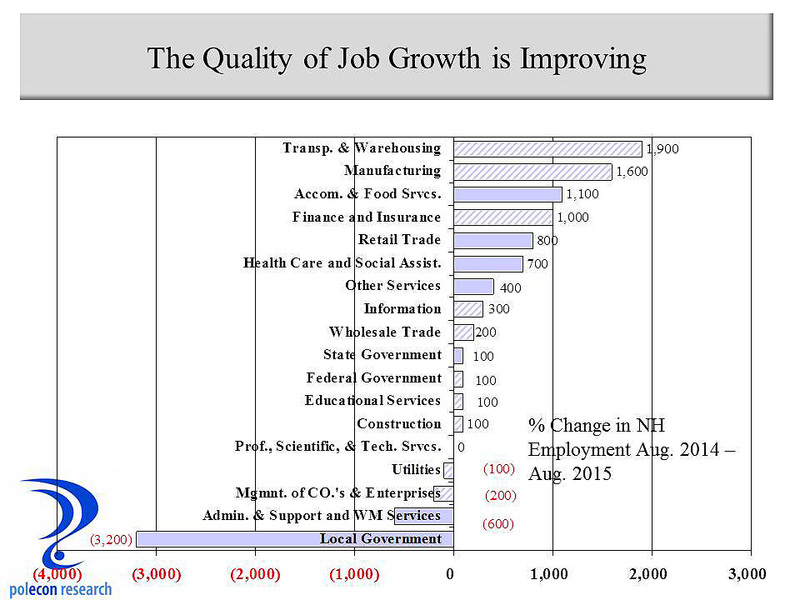 I don’t think the private sector job growth trend has gotten enough attention in NH. Many (including me at times) focused on several years of NH’s subpar total non-farm (including government) employment growth. 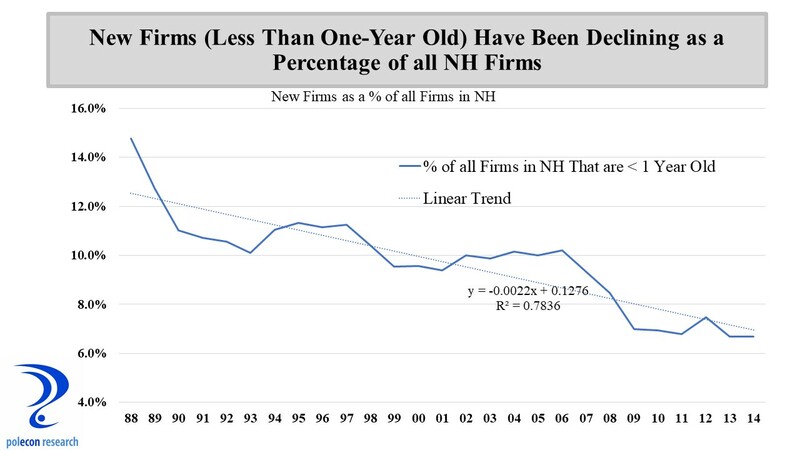 But as I have noted in prior posts, the percentage drop in government jobs in NH is among the largest of any state in the nation, masking some of the strength of hiring trends in NH’s private sector. The chart below shows how both private sector and state and local government employment in NH have grown since each sector’s pre-recession peak. Private sector employment in NH peaked in February of 2008 and after shedding 6% of those jobs during the recession NH has regained that many plus an additional 3%. State and local government employment in NH did not peak until April of 2010. It takes a couple of years for property valuations to reflect economic conditions so the largest declines in property valuations – and thus local revenues and employment- occurred as the recession had ended. State and local government employment in NH is about 8.5% lower than at its peak, with local government shedding about 6,800 jobs and state government about 1,000 jobs. 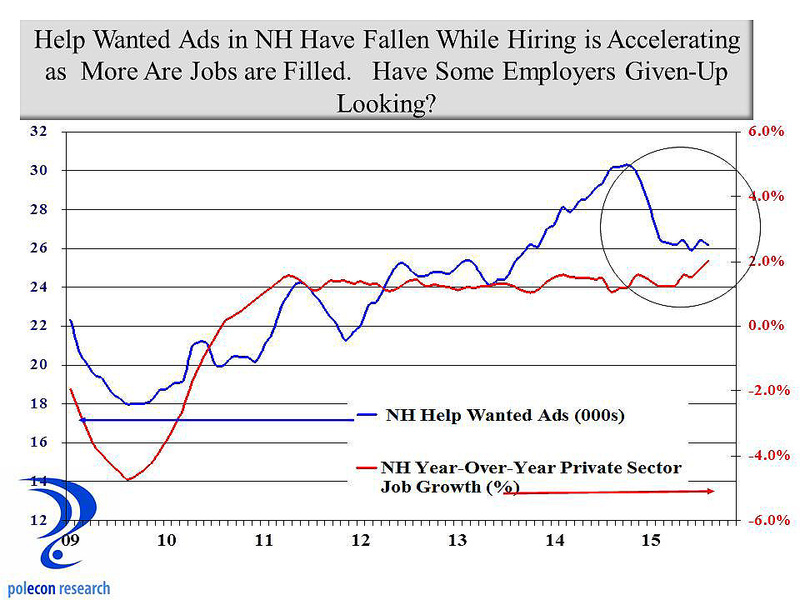 For too long in NH private sector job growth remained consistent at a subpar rate despite a large increase in help wanted ads in the state. 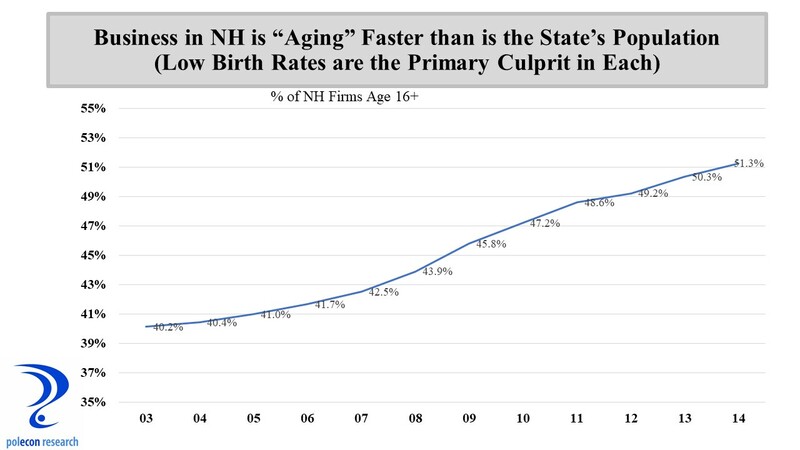 A combination of slow or no labor force growth and a mismatch between job opportunities and the skills of job seekers were the causes and not a fundamental erosion of NH’s business climate as I argued in this post. 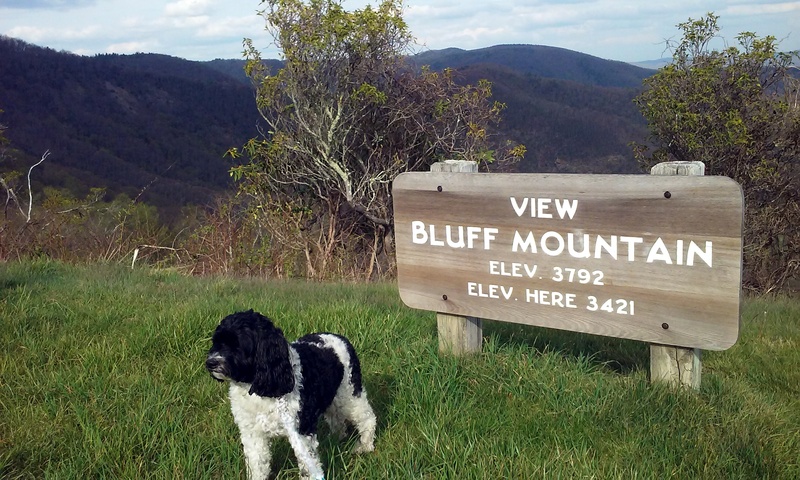 the state has lacked in recent years to achieve a faster pace of job growth. I am frequently in error but rarely in doubt and in this post last fall I was confident NH would again exceed the U.S. rate of employment growth (it is still possible but not likely) and that NH would see a 2.5% increase in total employment in 2016 (that is not going to happen). In fairness, private sector job growth has been on a more than 2% growth pace for the year and I did include two caveats in my forecast last fall: first that labor force growth in NH would have to accelerate (in part due to a resumption in net in-migration to the state) and while the labor force is once again growing in NH, it is at a pace that may not sustain the 2% plus growth that NH’s private sector is currently on. Second, the decline in government jobs would have to abate – it hasn’t. A month ago at a presentation at a local community bank I downgraded my job growth forecast for NH in 2016 from 2.5% to 1.8%. 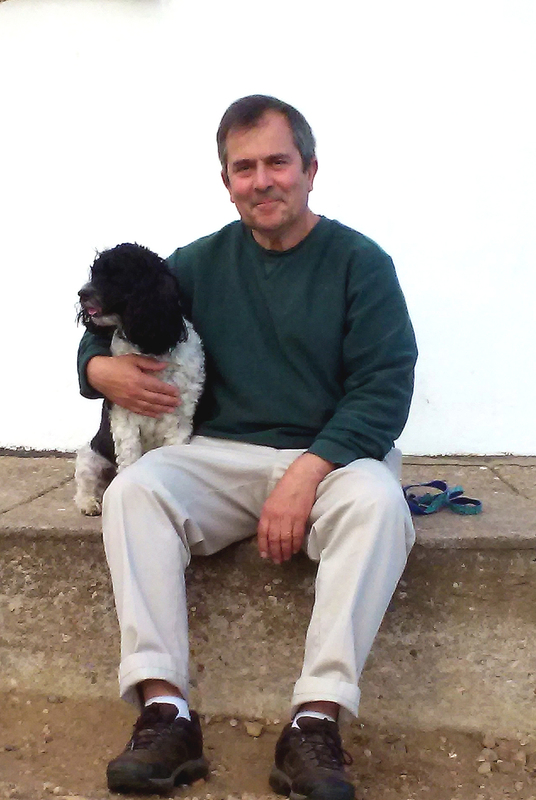 With more recent national economic data – including the May jobs data and March/April revisions, readings from my PolEcon NH Leading Economic Index, along with the uncertainties produced by the nation’s political climate, I now believe the rate of growth will be just 1.2 to1.4 percent.